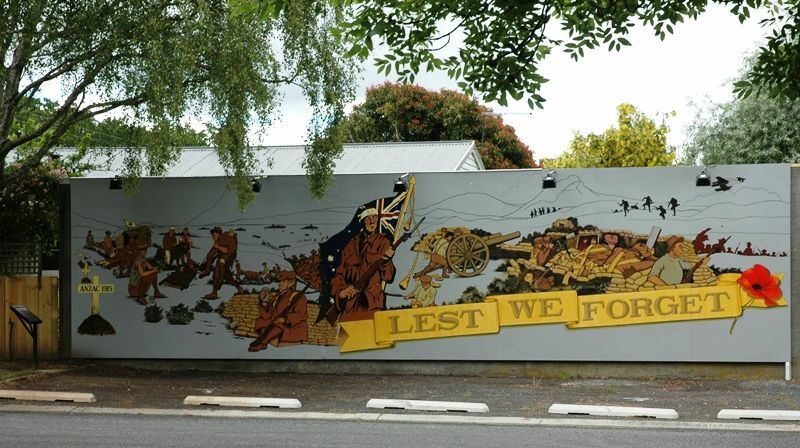 A mural commemorates the landing at Gallipoli and the centenary of ANZAC. It features a central figure with troops landing on one side of the mural, and troops being carried away on stretchers on the other side. The mural is 12 metres long by 3.1 metres in height. 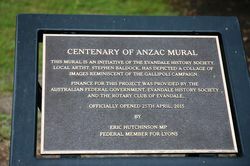 Most of the funding for the mural was raised by the Evandale History Society and Evandale Rotary Club, with funding also provided by the Anzac Centenary Grants Program. This mural is an initiative of the Evandale History Society. Local artist, Stephen Baldock, has depicted a collage of images reminiscent of the Gallipoli campaign.